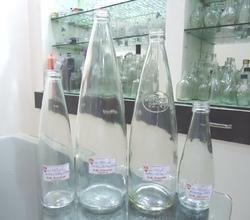 We are offering a wide range of Mineral Water Glass Bottles to our clients. 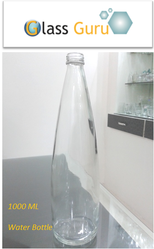 We are engaged in manufacturing a wide gamut of Glass Bottles for our prestigious clients. These products are extensively used for filling water, liquor, soft drinks and other liquid forms. Furthermore, available in variegated shapes, sizes and dimensions, our range can be obtained at industry leading prices. We are prominent manufacturer, supplier, wholesaler and exporter of high quality Mineral Water Glass Bottles offering attractive customized glass bottles for premium packaging of mineral water available in attractive shapes. For our esteemed patrons, we are providing a high quality series of Glass Slate Water Bottle that meet on client’s demand. Color: Yellow, Pink, Red, etc. Packing Type: Good packing deliver all over india. Printing: Many types of printing work. Any product. - We are direct importer. - We have a collection of water bottle.